Summersville Lake in West Virginia has an interesting history. The U.S. Army Corps of Engineers built the dam in the Kanawha River Basin to reduce downstream flood damage, maintain dependable stream flow, provide recreational opportunities, and enhance the fish and wildlife environment. 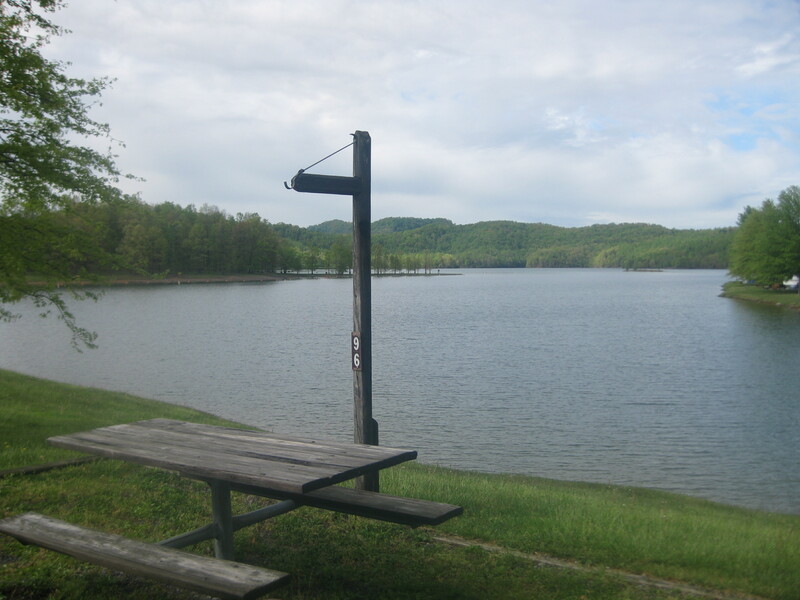 The Corps broke a long-standing tradition in naming Summersville Lake. 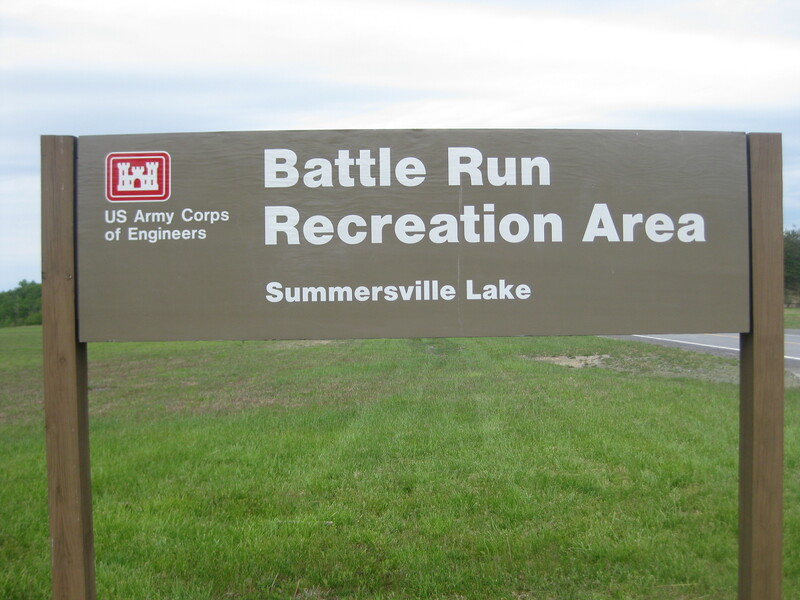 The Corps usually names a lake after the town closest to the construction site. 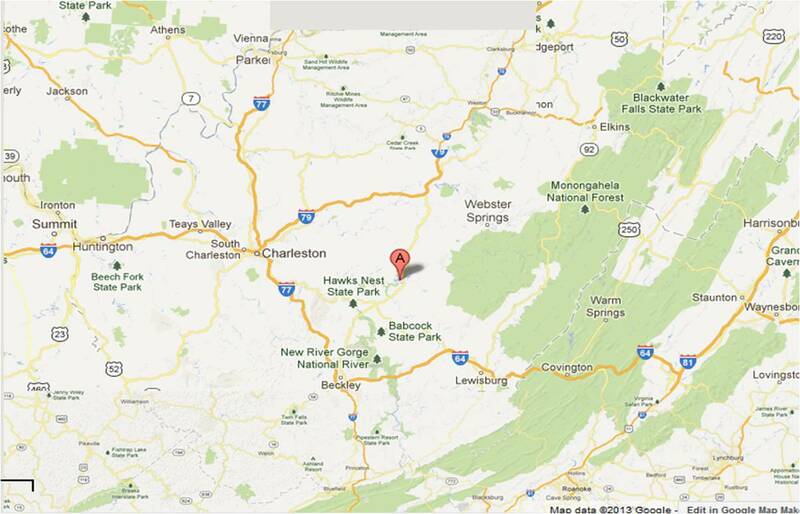 The closest town was Gad, West Virginia, located underwater, near the current location of the Long Point Marina. After briefly considering naming it the “GAD DAM,” it was decided to name it after the nearby town of Summersville. 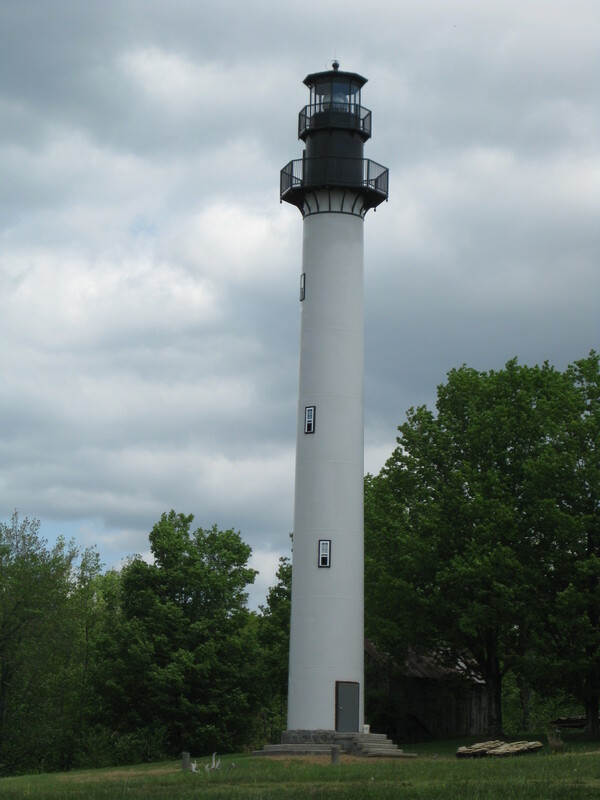 Summersville Lake has the distinction of having the only lighthouse in West Virginia. In 2001, a hydropower plant was added to the dam to provide enough power to light 5,000 homes in the area. The Corps of Engineers campground on the lake is the Battle Run Campground, referring to the Civil War Battle of Carnifex Ferry which took place nearby. What a great campground! Almost every site is lakefront and there are mooring posts along the shoreline to tie up your boat. We arrived in the rain and it continued to rain for the next couple of days. Consequently we spend a lot of time reading and taking it easy. When the weather started to moderate, we got serious about checking out the area. 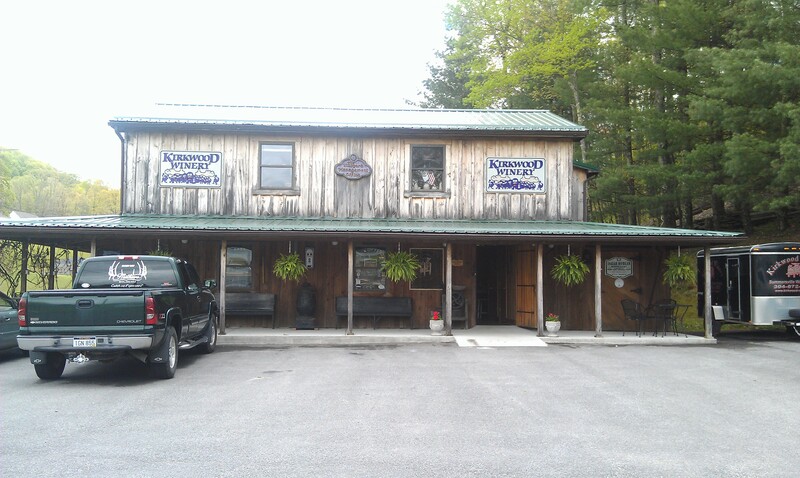 We enjoy visiting wineries on our travels, and we drove up to Summersville to visit the Kirkwood Winery. This is a small, family-owned winery and distillery. We were given a brief tour and our guide told us that they were the smallest licensed distillery in the United States. The emphasis was on the word, “licensed,” possibly a reference to “unlicensed” stills in the hills. It is a nice operation with free tastings and a good selection to choose from. It is also the home of the annual Grape Stomp Wine Festival, held the third weekend in September. Summersville Lake is near the New River and the Gauley River, some of the best whitewater in the eastern United States. Olympic kayakers train on the Gauley River. The New River Gorge National River and the Gauley River National Recreation Area are operated by the National Park Service. In addition to the whitewater rafting and kayaking, there are miles of hiking trails that allowed us to see much of the area up close and personal. Some trails will take you to the remains of old mines and mining towns that populated the area between 1875 and 1950. For years crossing the New River gorge meant long trips, or carefully winding your way down narrow mountain roads. It was not until the completion of the New River Gorge Bridge that this travel problem was solved. The bridge reduced a 40-minute drive down narrow mountain roads and across one of America’s oldest rivers to less than one minute. 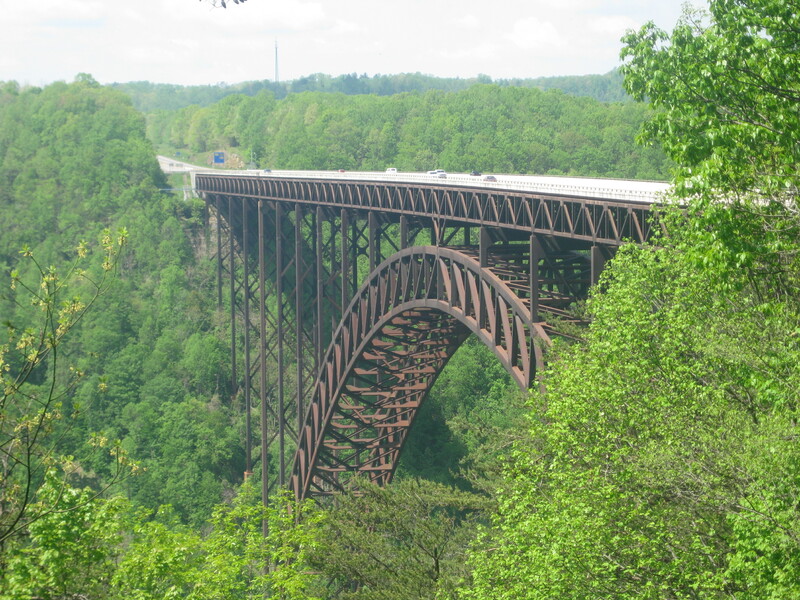 The New River Gorge Bridge was completed after four years of construction on October 22, 1977, and is the longest arch bridge in the Western Hemisphere. On the third Saturday of October, the Fayette County Chamber of Commerce hosts “Bridge Day,” the only day that visitors may walk across the bridge. The event lures hundreds of BASE jumping parachutists, cheered on by thousands of spectators, to parachute the 876-foot drop to the river below. 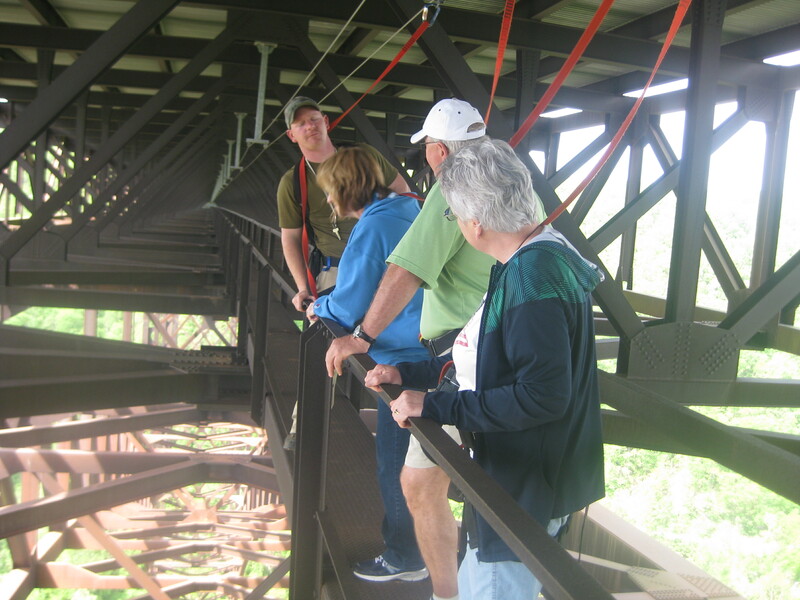 One of the nice things to do in the area is to take a guided walk on the catwalk that goes under the Gorge Bridge. You are hooked on to an overhead cable as you travel under the roadway. The bridge is shaking from side to side from the wind and traffic and the views are terrific. Our guide told us about the history of the construction and the events of Bridge Day. 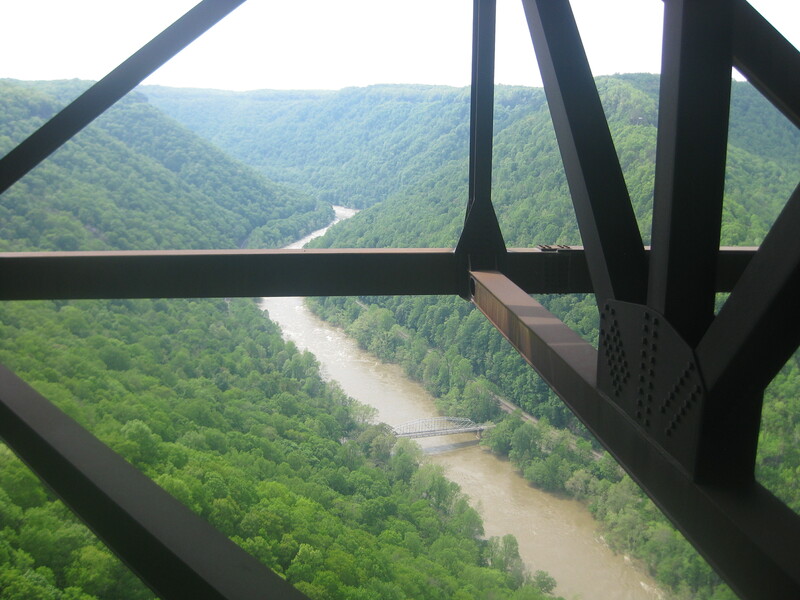 We were able to see where rappellers hook onto the bridge for their descent to the river 850 feet below. 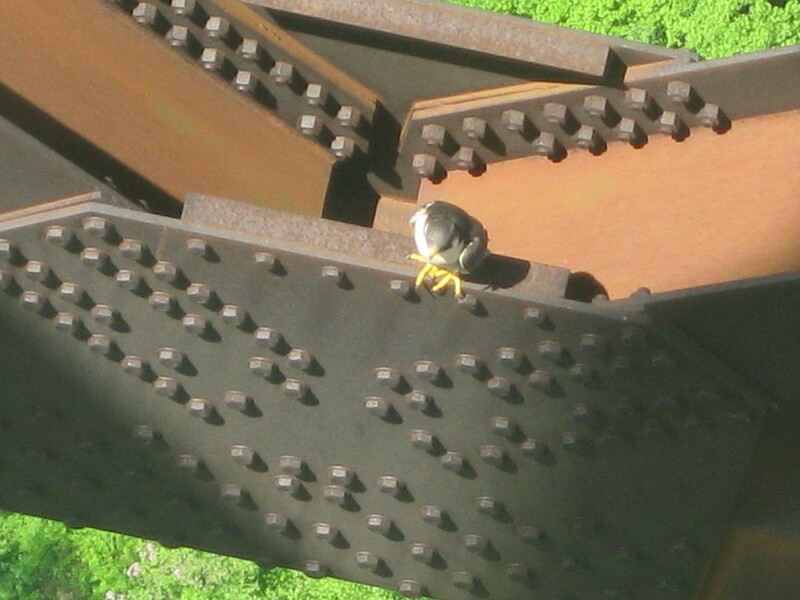 Pigeon droppings cause deterioration of the steel on the bridge so the bridge authorities brought in a pair of Peregrine falcons to nest in the bridge. The falcons are natural predators of the pigeons and have “taken care” of that problem and we watched them fly around the area of the bridge. The National Park Service Visitor Center has a short film that describes the history of the area and the bridge that we found to be very informative. 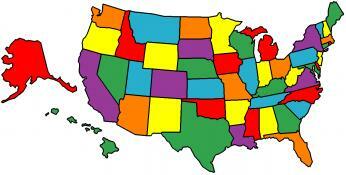 You can also get a list of hiking trails in the area with maps and directions to the trailheads. We took one day to hike to Long Point on the south side of the new River. 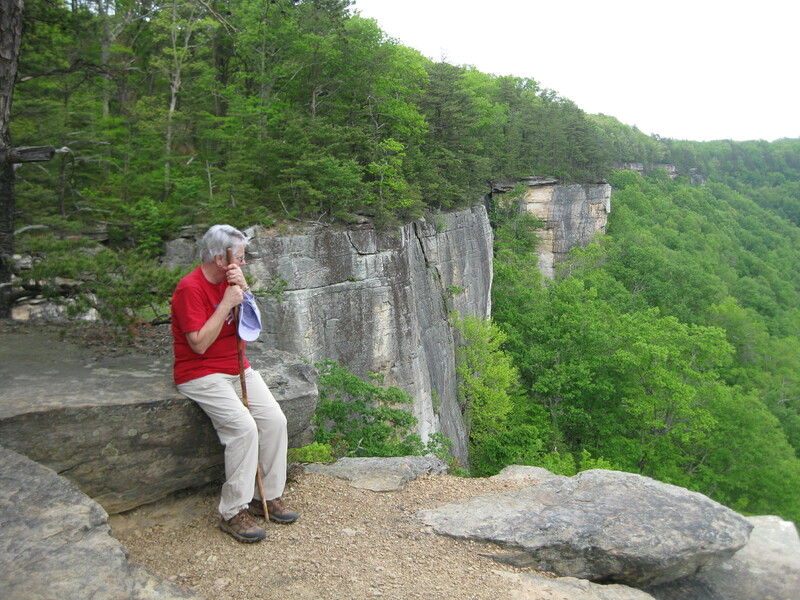 This rock ledge is a great place for a trail lunch and what is probably the best view of the New River Gorge Bridge. While we were having lunch a man rode in on his trail bike. He had grown up in the area and was able to give us more insight into the challenges faced in the construction of the bridge. 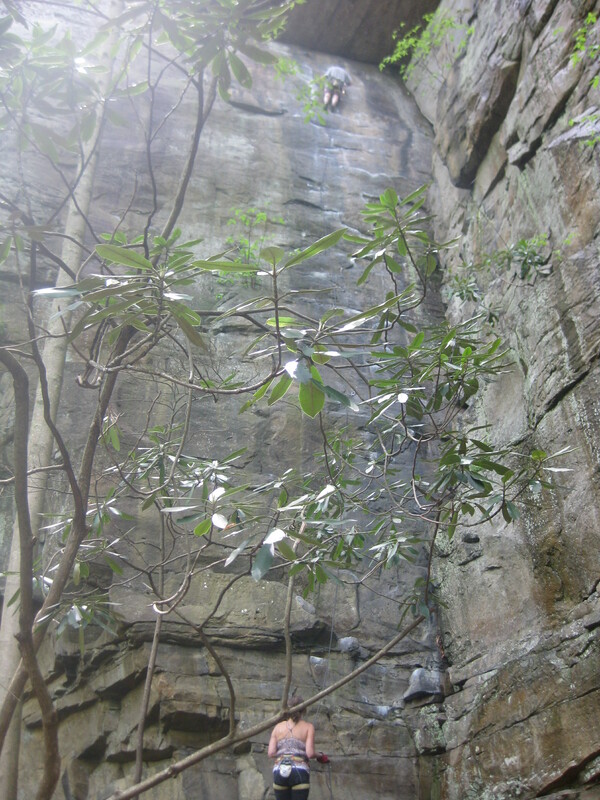 The New River Gorge has some great rock climbing sites and one site was on a spur trail from the one we were on. I went down it to the cliff and watched two climbers doing their thing – it was something to watch them go up like spiders on the rock face. 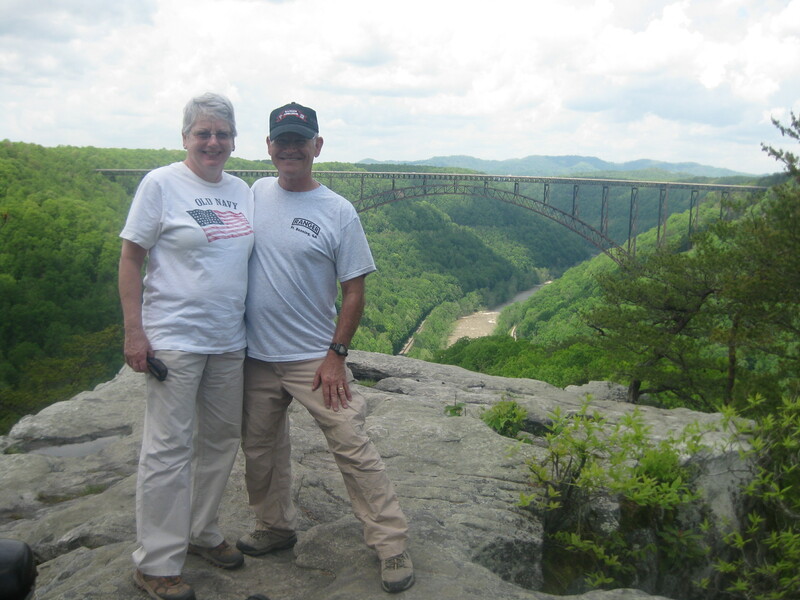 One day we took one the New River Gorge Scenic Drives, the Fayette Station Road Tour. This drive takes you along the route local residents had to take to cross the New River before the Gorge Bridge as built. We got a good feel for the challenges they faced on the narrow road with multiple switchbacks as we descended into the gorge and back up the other side. 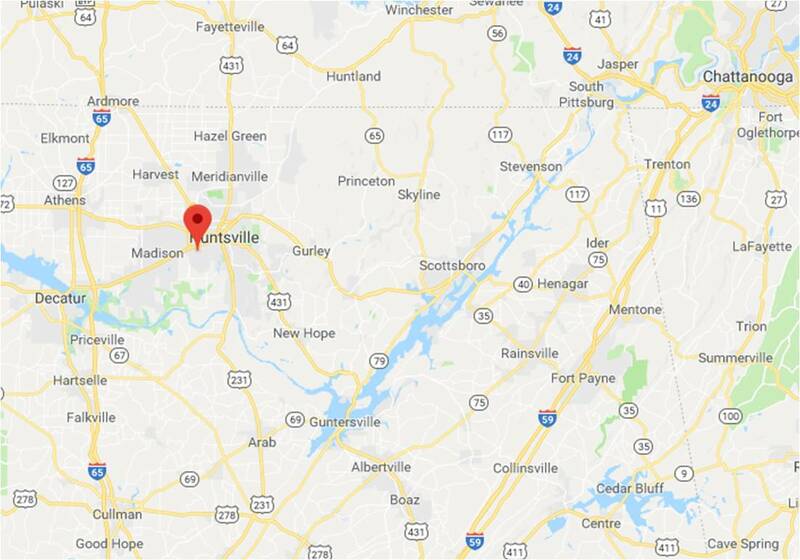 Along the route are opportunities to stop and read interpretive signs that described what the area was like between the 1870’s and 1950, when coal was the king in the area and everything revolved around the coal mining operations. There is a free CD you can pick up at the National Park Service Visitor Center that will give you a stop by stop narration of the route. 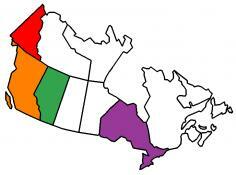 This was a great way to explore and experience the history of the area. The high water conditions were obvious at one of the stops! Another day we hiked down the Headhouse Trail to the site of the Nuttallburg Mine. While the mine is closed off for safety reasons, many of the old buildings are still standing. 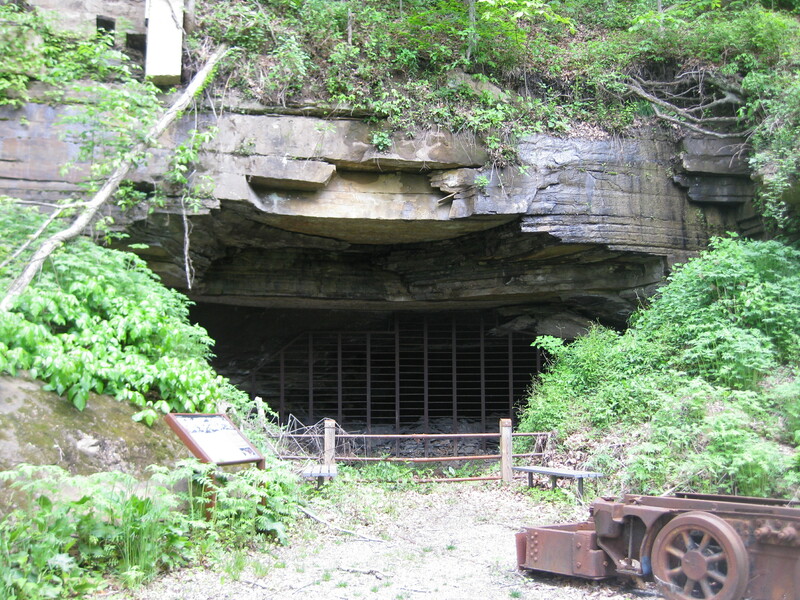 Interpretive signs and Ranger-led tours describe the mine’s operation. 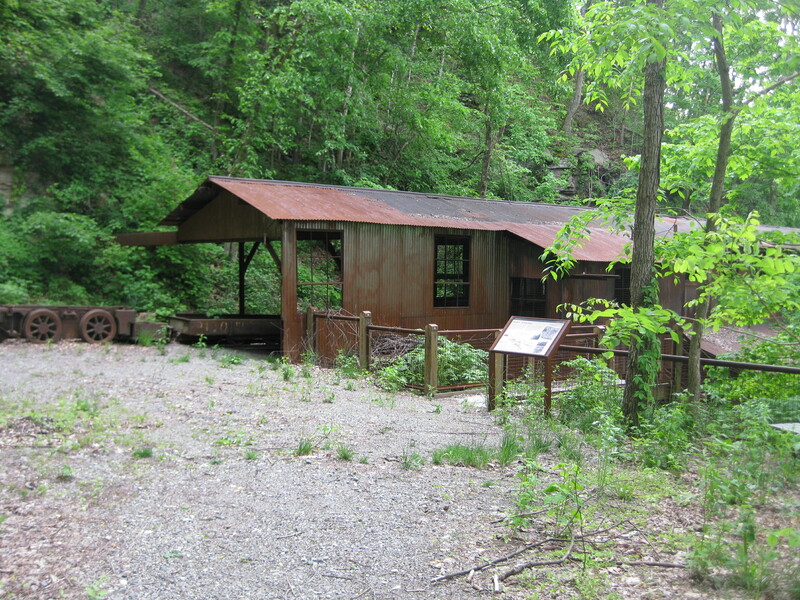 The conveyor that hauled the coal from the mine down to the rail loading site at the river was designed by Henry Ford and can be viewed today. After that we drove a short way to hike the Endless Wall Trail. This trail offers scenic views of the gorge, as well as access to some of the best rock climbing in the eastern United States. The overlook at Diamond Point is a great place to stop for lunch and enjoy a truly spectacular view of the New River. 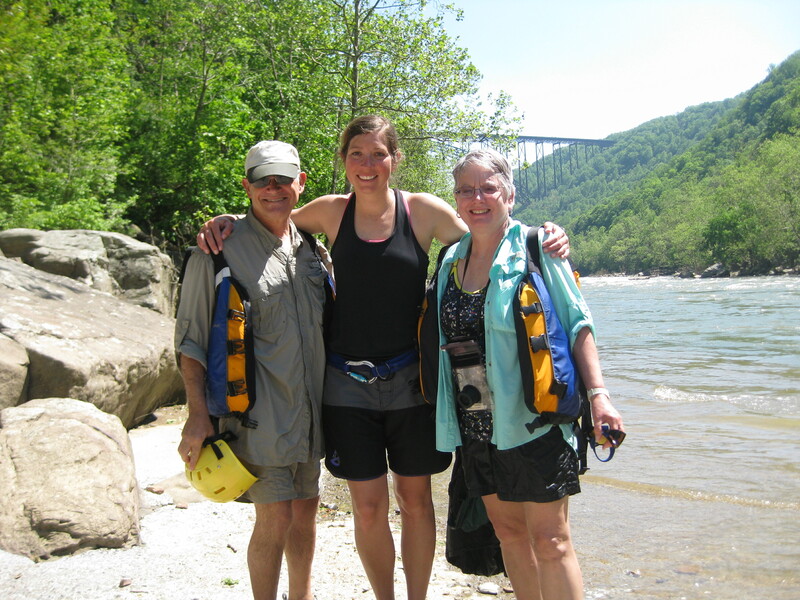 No trip to the New River Gorge would be complete without a rafting trip down the New River or Gauley River. We took a full day trip down the Lower New River with ACE Adventures. We had been monitoring the weather forecasts, as the weather had been rainy and cold during our stay, and we decided to book the trip for Wednesday, May 15th. We picked the absolute perfect day for a trip down the river, the sun was out and temperatures in the high 70’s. We were told to dress to be wet and we were not disappointed. The first rapids we hit was a Class IV rapids called Surprise. We crested the top of the run and ran right into a ten foot wave that soaked everyone on board! 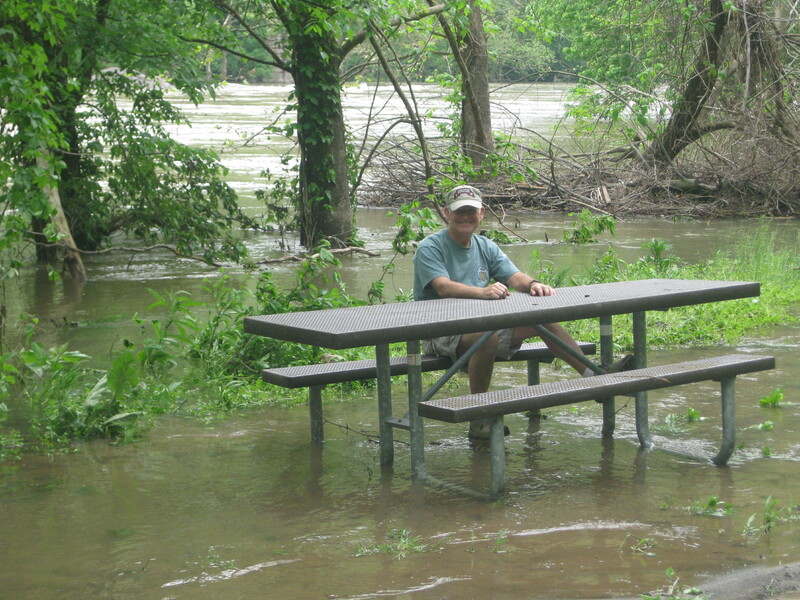 Due to heavy rains in North Carolina the river level was high and the river was running very fast. We hit a series of Class III, IV, and V rapids, mostly IV and V. Our river guide and trip leader Eileen did a great job of guiding us downstream. I think Pat got nervous when Eileen would tell us at the beginning of each rapid which direction to swim if you fell out of the boat! We stopped for a lunch of burgers and chicken with all the “fixin’s” before we headed further down river. The afternoon portion of the trip was a bit wilder than the morning with water hazards such as the “Meat Grinder” and “Whale” to get past. 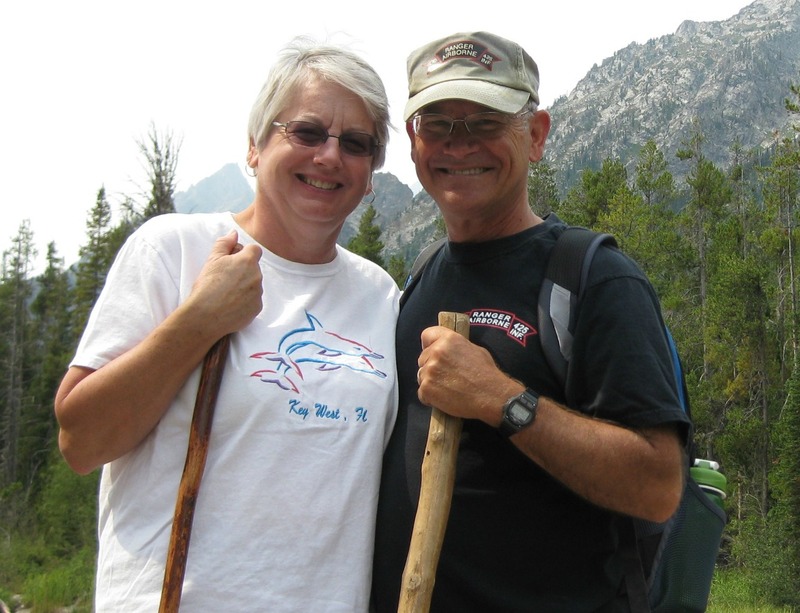 All in all it was a great rafting experience that we both enjoyed and one we will remember for a long time. Thursday, we decided that we would take it easy and get packed up. That turned out to be good planning as we got hit with one heck of a storm in the afternoon. 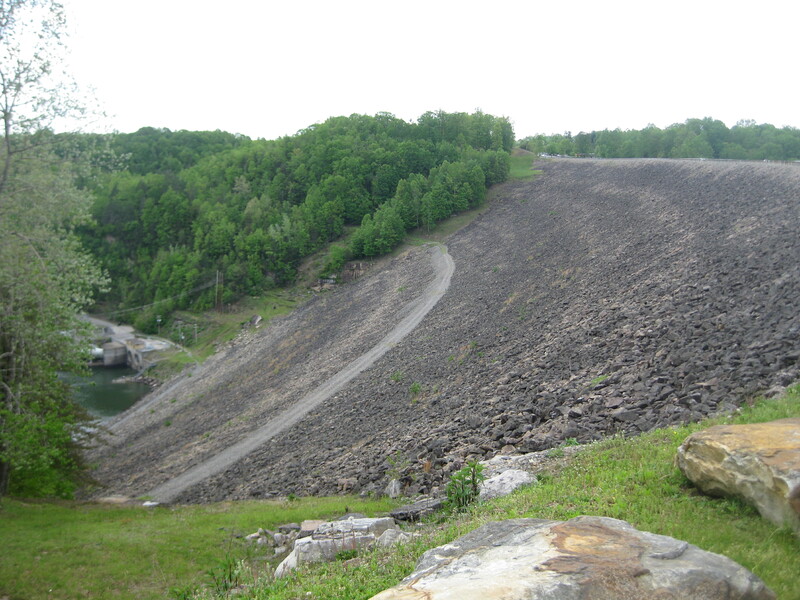 On Friday, May 17th, we made the short drive to our next stop, Stonewall Jackson Lake and Dam, near Weston, WV. 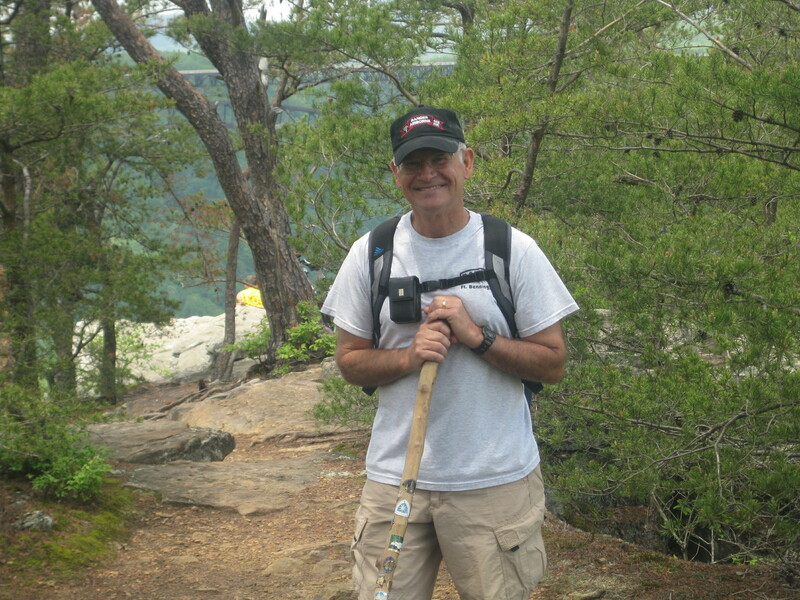 This entry was posted in Civil War, Fulltime RV, Michigan Traveler, National Parks, U.S. Army Corps of Engineers, West Virginia and tagged backcountry hiking, fifth wheel trailer, full-time RV, fulltime RV, Kayaking, Kirkwood Winery, Lighthouse, New River, New River Gorge, RV Forums, Summersville. Bookmark the permalink.